On a tiny beach at Erie Basin Marina in Buffalo, N.Y., Nate Drag scans the sand and driftwood. 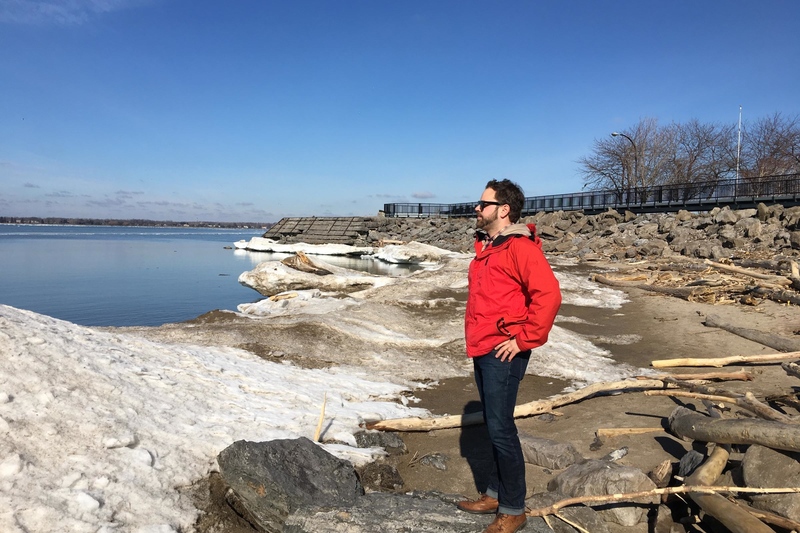 He’s part of the Alliance for the Great Lakes, and he helps organize beach clean ups. “The closer you look, you can start seeing the plastic popping out,” he says. LISTEN: You Want to Ban Plastic Bags? The Alliance is one of many organizations advocating for reduced use of plastic bags. Around the Great Lakes, many environmentalists are concerned about the impact of plastics on wildlife. Back in his office, Drag says the same things that make plastic bags so great for us, also make them bad for the ecosystem. San Francisco became the first major city to ban plastics bags outright in 2007, and other cities have followed. But some local laws — like one that imposed a 5-cent bag fee in New York City — have been blocked at the state level. Some coastal and Great Lakes communities have proposed bans or charging small fees for using plastic bags at the checkout counter in stores. Some companies enforce their own bag rules. Michaela Cultrara is the community relations supervisor for Hart’s Grocer in Rochester. N.Y. She says they offer 10-cent credits to customers with reusable bags. Not everyone is moved to change. As a customer named Micah Hopkins checks out at a Hart’s register, he opts for a plastic bag. He says a small fee probably wouldn’t change that. Though the fees might add up after a while, he says, “I don’t think it would make me bring my own bag. “Opponents of bag bans say fees disproportionately impact low-income shoppers. Others say reusable and paper bags are rough on the ecosystem, too. And some companies argue that it’s inefficient to have regulations vary from city to city. In some places, like Michigan and Wisconsin, the backlash against local bans has caused state lawmakers to ban local bans altogether. To fight the backlash, Sherri Mason is taking a different approach. She’s a professor of chemistry and chair of the department of geology and environmental sciences at SUNY Fredonia. At a public forum in Buffalo, Mason regales her audience with plastic bag facts. But her outreach goes beyond trying to communicate the scope of the problem. Mason is involved in several studies to try to connect the use of plastic bags to human health. She says plastic bags break down in the water, become microplastics, and get into our bodies in different ways. Plastic can act as a perfect surface for chemicals to hitch a ride — including chemicals that cause problems in human hormone development. The studies are still underway, but Mason says if the plastic is in the water, it’s in us. Veronica Volk is a reporter/producer for Great Lakes Today, a new regional journalism collaborative covering the iconic lakes and the people who live in the region.